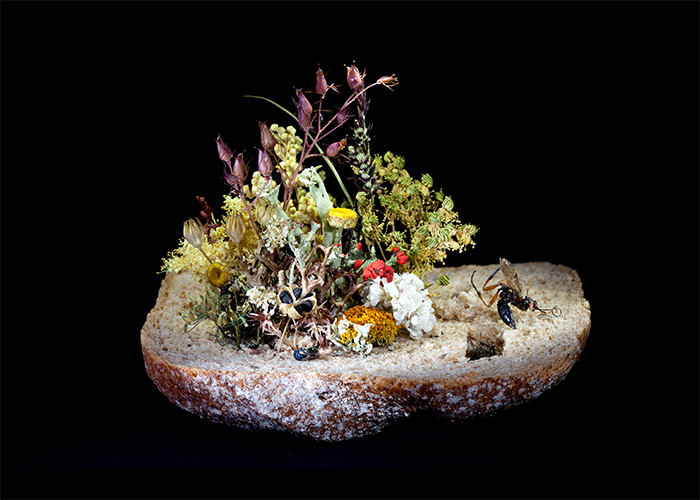 These images document slices of bread staged with dried plants and dead insects. There are several aspects of this dead scenography. On the one hand, there is an infinity of variations, fantastic shapes and visual directions – that is, “movements” of lines - on the other hand, one is confronted with decaying materials. These macro-scenes referentially belong to still life and the Vanitas artistic tradition. Still life (or nature morte) is a genre of painting in which painted elements include inanimate objects, often food, plants, dead animals, drinking glasses and vases. Today, still life is carried and actualized by artists working with photography, video, digital graphics, found objects, installations, etc. Vanitas is associated with still life painting, but its content has strong symbolic connotations. The elements of Vanitas convey the meaninglessness of earthly life. Symbols like skulls, rotten fruit and animals, watches, extinguished candles or musical instruments are intended to remind us about the certainty of death, (Memento Mori), temporality of earthly pleasures and mortality of organic life. These are references my work cannot avoid, but I must admit that some references came after I began working with this project. There is something existential about bread. And it has strong symbolic connotations. Bread is a basic food for many nations, and in times of hunger, can become a most precious THING.There are also examples of prisoners in concentration camps making Christian symbols like a cross and a holy rosary out of bread. In such cases, bread becomes “gold” and transforms the immense will to survive into faith. Nature does not save effort to shape the micro and macro worlds. These are ingenious, thoughtful works of artisanship, if I can describe these masterpieces in this way. The richness of forms that nature gives conceptualizes a kind of cabinet of curiosities. 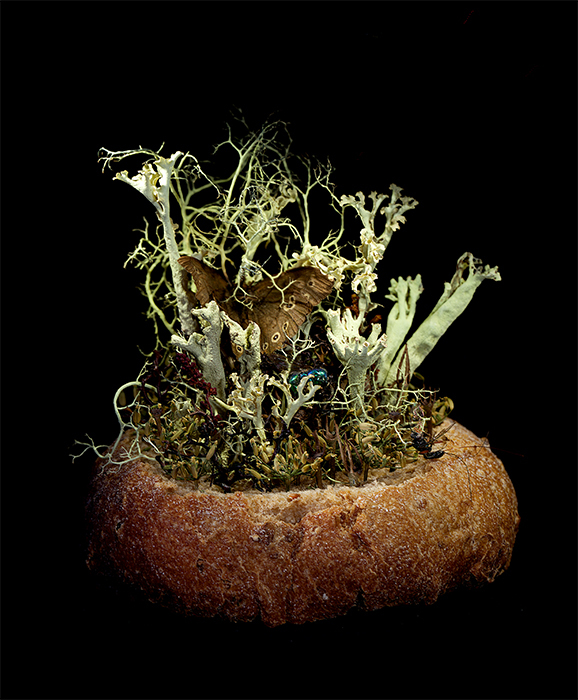 My bread islands are micro cabinets of curiosities, there is so much to study on the surface of the bread, all one needs is just a magnifying glass. In my work, the bread slices become islands. They become islands of still lifelessness. 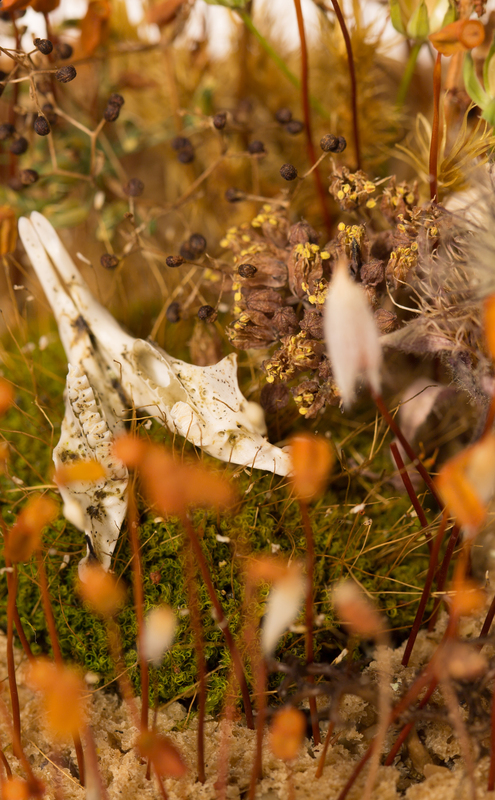 In this “lifelessness” of nature, there is a complexity of mini-forms of plants and insects that have been preserved despite their being dry and dead. These separated and individual islands are carefully composed from wild plants drawn from meadows to become lifeless micro gardens. 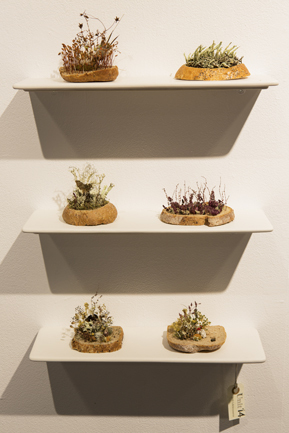 The staged islands conceptualize graves of the beauty of wild plants which has no aesthetic value otherwise. Wild plants and their ordinary but wonderful micro-forms scare me because I do not understand why such a masterful craft is just carpet on which I walk and trample on every day with my dirty shoes. Those fragile territories I staged, silently draw attention to themselves and maybe teach us to respect ordinary lives. Peter Mathiessen says in his book The Snow Leopard that to pluck wild flowers in Tibet is a sin. Usually one does not see weeds (wild flowers) because to see them requires one to kneel down. I do not understand everything about these islands of lifelessness, for there is something illogical about those assemblages. The staged Vanity on piece of bread does not give clear messages. 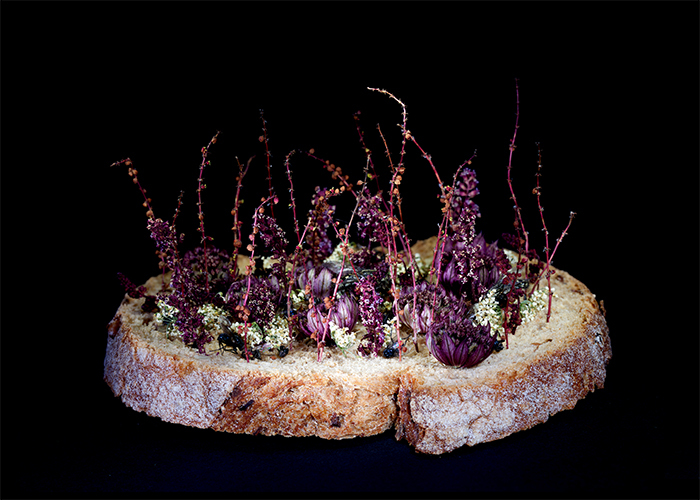 Perhaps, there is nothing, just staged weeds on bread. There are some examples of interesting books with contemporary still life and Vanitas: Nature Morte. Contemporary artists reinvigorate the Still-Life tradition by Michael Petry; Dead or Alive by David Revere McFadden and Lowery Stokes Sims.